Sugar Beet Crafts on Etsy!! It has been a while! I apologize for the disappearing act! Last year I went back to school and it overran my life! Due to some family emergencies, I have decided to take this semester off so I can help out as much as possible. I also decided, it was time to stop neglecting my poor little blog and start adding tutorials again. So without further ado… A Trash to Treasure Tutorial! Have you ever looked at all those boxes and tins that come with products and think “I cant throw that in the trash! ?” Well I do, in fact I have a huge collection and a mission to do something with them. In this tutorial I used an old metal band aid box to make an adorable little pom pom box. You can do this with anything. In fact, I am making another one out of a Tin that Tea came in. Remember when Band-Aid boxes were made of tin!? I know all the collectors out there are shuddering right now, but I have more than one. TA-DA!! 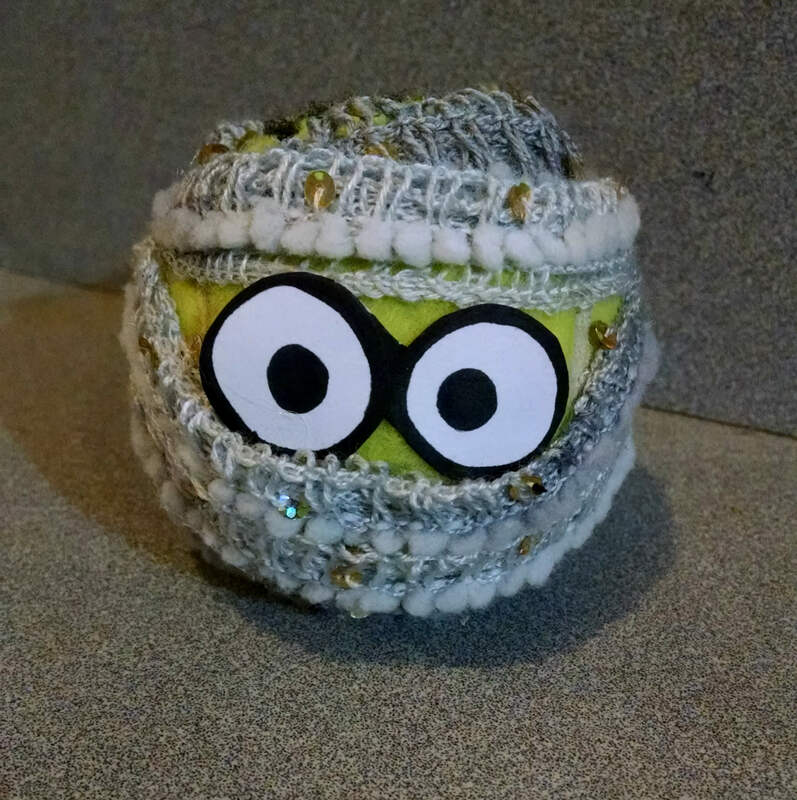 A cute puffy little Pom Pom box. A perfect bank, storage solution or gift box. If you make one, I would LOVE to see it, feel free to post pics in comments! I took this picture earlier this year in the Pacific Palisades 2016. I love the cloud formations. I am so excited about this post. I love to draw, always have, probably always will. I have never formally taken a class or had any sort of training so I have always been shy with my art. Recently I have decided to just start drawing and putting it out into the world. I used all sharpies to make the valentines day cards. So I thought it would be a fun idea to make my mom and dad a thank you picture using all the cool markers they bought me for Christmas. I liked it! So I took a really high resolution photo of it, and had it made into real Thank You Cards! Here is how they turned out! I also decided that they would make awesome Thank You coupon cards for my etsy store. I am super happy with them. If you love to doodle or draw or take pictures, don’t be afraid to take your art to the next level. It is really fun and easy to do. Have you been inspired to draw lately? I would love to see it, feel free to post a link in comments. I hope this post finds you having a wonderful February so far. Can you believe Valentine’s Day is just around the corner already!? This year is flyin’ by. Have you ever wondered where the tradition of Valentine’s Day Cards came from? Well it has been rumored that the very first Valentine’s day card was sent by Saint Valentine himself. He sent it while he was imprisoned and waiting for execution by the Romans. It seems he was quite taken with a jailer’s daughter. And so just before his death he sent a letter and signed it Your Valentine. The oldest known Valentine’s day card is kept at the British Library in London it is a poem written in French in the year 1415 by Charles Duke. He wrote it to his wife, while he was imprisoned in the Tower of London. I would actually love to see it, is amazing it has lasted this long. So to celebrate this wonderful day of Love and Friendship, I decided to make my own Valentine’s Day Cards just for you. I created 8 free Valentines day cards. Each one hand drawn and colored. They are great to print out and pass out to friends, teachers and loved ones or you can print them out punch a tiny hole in the top string them up and make a cool banner out of them. 7.) You Are My Star Valentine. Valentine’s Day Card. * All cards are included in one PDF download. All cards fit on one 8×11 piece of paper. They work best printed on card stock. I hope you enjoy! I would love to know what you think! Did you create your own valentines day cards? I would love to see! Share your link in comments! Can you believe it is already February? This year is flying by! Last year I made these awesome little pins for my boyfriends band, a cute little freebie to give away to people that came to the valentine’s day show. They were such a hit I decided to share them with you. They would be fun for a class project or a fun way to show your valentine’s day spirit at work. The theme of last years show was “Wear your heart on your sleeve” so these little pins were fantastic. Felt Hearts by Creatology, bought at Michaels Crafts. The felt hearts can also be made with plain felt, I just chose to use these pre-made hearts because they have writing on them like the little candies, and they were really inexpensive. Cut up the extra felt piece into small squares. You want to make the square smaller than the heart and small enough to fit inside the small safety pin. Use the glue gun to make a small dot of glue, place an open safety pin down into the glue face up. Ta-Da! Cute lil’ valentine’s day pins! These things are so easy to make! You should have no problem pumping out a bunch for a party favors or fun giveaways. What are you doing for valentine’s day?! 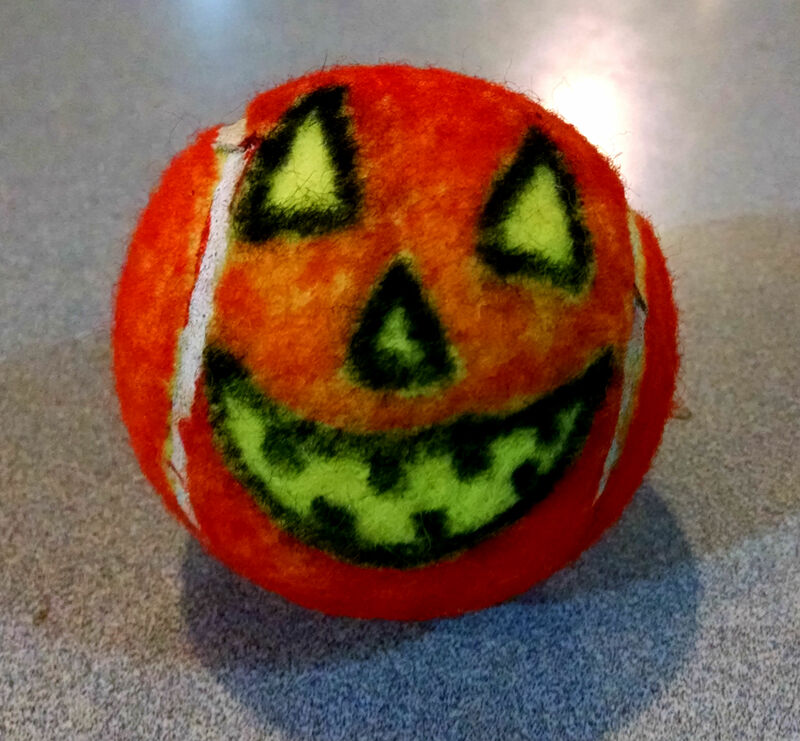 Recycled Tennis Ball Halloween Creatures! I hope you are having a fantastic October so far! Can you believe Halloween is next weekend already! Where does the time go…other than away! So, I work in a tennis shop, and where there is tennis there are a lot of tennis balls. 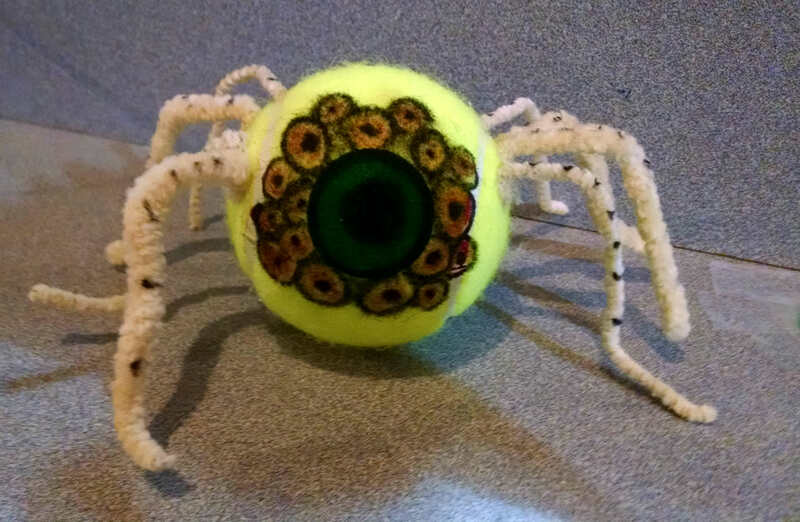 Rather than throwing out some of the old tennis balls around the shop, I decided to convert them into fun creatures for Halloween, and I must say the kids are loving them so much, that I decided to share them here. These fun little guys are so easy to make. You only need a few things, most of you probably have around the house already. Optional: Googly eyes instead of drawn in eyes for spider. Super easy Just draw with your black sharpie triangle eyes a nose and a mouth. Then use an orange sharpie to color everywhere but in the eyes, nose and mouth. Let dry for a minute or two. Also super-duper easy. Draw two large circles for eyes with your black sharpie. Add a circle for the nose and some fangs. Use a brown sharpie to color the rest of the ball, you can use black but the details of the face will be hard to see. For wings, I used an index card and drew out a wing, then cut it out, and used this wing as a template for the second wing. Just make sure you flip it so it is in the correct direction. Once both wings are cut out, use a large marker to color in the wings. I then used a fine tip sharpie to add the details. Make a small bend in the wing where it will attach to the body. You can either use a glue gun or tape. If you use tape, put a rolled piece of tape under the bend and then use a few more across the top. If you use glue gun, add a tad of hot glue to the folded part of the wing and stick it to the body. I used 4 small pipe cleaners and cut them in half. Use a hot glue gun to attach to the ball. Let dry completely between adding the legs so they don’t fall off. Then use a sharpie to draw on eyes. You can also glue on googly eyes if you have them. I added a few stripes to the legs. You could also color them in, or use a sharpie to color the whole ball. First, use an index card to draw out some eyes. Use hot glue gun to glue them onto the ball. Let dry. Grab your yarn, string or fabric and your glue gun. Add a small dab of glue around the top of the ball and slowly start to wrap your yarn around adding tiny dabs of glue all along the way. Continue to wrap around until you go all the way around. The possibilities are endless. I would love to see what you come up with.